One of the most talked about trends over the past three to four years has been the increased use of drones. From everything to infiltrating White House property to capturing aerial photography from amazing angles, drones have made many a headline, but most people do not realize the potential benefits they hold in store. Historically, drones have been used for the most part in the field of battle to scope out enemy territory for strategic purposes when an area was unsafe for troops to survey. But now there is a growing interest in drones for a wide variety of activities. 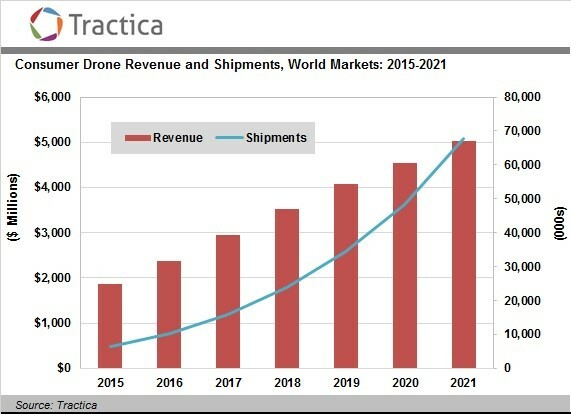 To put this growing interest in perspective, the demand for drones is expected to increase fivefold over the next four years despite the projected decrease in price per drone. Put simply, people are ordering more drones faster than the price is going down. One of the fastest-growing uses for drones is in the field of search and rescue. Though this is not a widespread activity at this time, there are groups, such as SWARM (Search With Aerial Rc Multi-rotor), which consist of over 1,000 drone users around the world who use the aerial technology to find missing persons and drop in supplies. Drones can cover more ground in much less time than an on-foot search and rescue team, which could lead to more rescues; they are also much cheaper than search aircrafts such as helicopters. On a more recreational level, drones have established an entire new genre of sports. Drone racing, organized by the Drone Racing League, or DRL, is the most popular drone sport at the moment. In fact, it might be the most popular sport that you’ve never heard of. The first two seasons have been aired on ESPN, drawing over 30 million viewers in its inaugural 2015-2016 season. These are just two examples of how people are beginning to use drones. In a world where efficiency and speediness are so important, there are bound to be many more ways to use them: delivering packages, filming and surveillance, surveying unsafe areas, and ways that we have not even considered yet. But this is slowly becoming a reality, and as drones begin to permeate our everyday lives more, the drone industry will grow at an exponential rate.